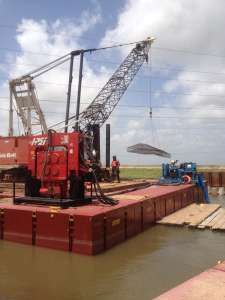 As the Texas Gulf Coast continues to gain worldwide recognition by leading the race in the manufacturing resurgence era due to the shale gas boom, companies like The DOW Chemical Company are strategically investing and expanding operations for better access to affordable natural gas resources. With the Gulf Coast economic boom on the horizon, specialty contractors such as Standard Constructors, Inc. are able to pave the way. 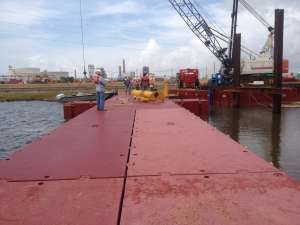 Standard Constructors, Inc. received a contract from FLUOR Corporation to drive 3,018 pre-stressed concrete piles in Freeport, Texas. This ten-acre job site is located within the LHC-9 block of the DOW Gulfstream project. Despite experiencing three months of delays from permits and drawing revisions, Standard reached final completion by October 24th, 2014. No two industrial construction projects have ever been the same; each job has its own hurdles and restraints this project proved no different. Weather and soil conditions proved to be the greatest obstacles for this specific project. 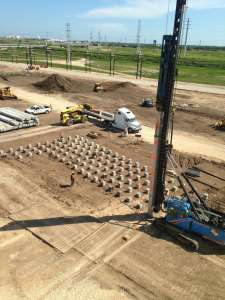 Texas Concrete Partners out of Victoria, TX, manufactured and supplied the 36’X16”x16” precast concrete piles. Combinations of tension and compression piles were driven as base foundations for furnaces (soon to be the largest furnace structure in the world), heavy vessels, towers, and compressor decks to achieve the final project requirements. With the majority of the jobsite being unworkable for extended periods of time, Standard had to work when and where they could with safety as the number one goal. The majority of the piles were driven for the 8 furnaces, as well as the tower crane pads to be used for assisting in the future installation of the furnaces. Each furnace foundation (two furnaces per foundation) required 572 piles driven to a specific grade and to a carefully engineered capacity. Every driven pile was documented with its location, depth, energies, and blow-counts to aid in future construction. Standard Constructors, Inc. self-performed 95% of the work while the subcontractors, GRL Engineers Inc., Aggregate Technologies, and Holes Inc., performed the remaining 5%. Standard provided new insight to the pile driving community through their state of the art equipment and strategic plan execution. The General Contractor, FLUOR, is also a proud member of the Greater Houston Area ABC Chapter. This complex piledriving job became a critical milestone for a multibillion-dollar expansion; we are proud to submit this project for consideration into the 26th Annual ABC National Excellence in Construction Award.